On the run, right fielder Osvaldo Sanchez dove. The ball sinking fast, Sanchez got his glove under it for the out. "I thought the ball was a base hit," Sanchez told The Spokane Chronicle after the game. "But I just kept going." That catch was one of three The Chronicle categorized as sensational catches that night in late July 1987, all helping Sanchez' Spokane Indians to an 8-0 victory. But, while Sanchez was able to flash his glove at short-season Spokane and into AA ball, Sanchez was never able to flash his glove in the major leagues. Sanchez' career began that year with Spokane, having been signed the previous off-season out of his native Puerto Rico by the Padres. That season, Sanchez' bat wasn't as good as his glove. He hit .223 with three home runs. One of his hits came on a two-run double in July. But, by late July, Sanchez had gotten hot, going 9 for 16 over four games. The previous month, in June, Sanchez just missed a cycle, getting a single, double and triple. He hit another ball to the fence, but it was caught, The Chronicle wrote. It was his first start in several days. "He's been swinging well in batting practice," Spokane manager Rob Picciolo told The Chronicle. "He was getting too much rust not playing. It's a credit to him for staying ready." Sanchez split 1988 between the rookie Gulf Coast League and single-A Charleston. He hit .339 in rookie ball, but just .190 at Charleston. He played both 1989 and 1990 at single-A Waterloo, hitting .217 his first year and .266 the next. Then it was high-A High Desert for 1991 and a .244 average. That off-season, the Braves selected Sanchez in the minor league draft. Sent back to high-A, Sanchez hit .234 at Durham. 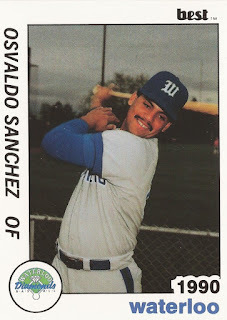 His final year came in 1993, the only year where Sanchez saw time at AA, with 33 games at Greenville. A .220 average there, and Sanchez was done, short of the majors.